The July meetup will feature presentations, demos and discussions. How Fully Immersive VR is Transforming Healthcare Training: Brad Wrigley is the COO and a Co-founder of Marion Surgical, a Cork and Toronto based company. Brad comes from 20+ yrs working in the BPO Consulting and Tech Industry (but still claims not to be a techie). Training Medical Professionals to Analyse Microscopy Datasets in Mixed Reality: Dr. David Trainor is the CEO of Sentireal, a training technology company based in Belfast. Sentireal's software and media generates personalised content using AI and presents that content using VR/AR/MR technologies. Augmented Reality for Education – the potential and opportunities: Darya Yegorina is Founder and CEO of Cleverbooks, who develop Curriculum-based Augmented Reality Solutions for Education. She'll speak about why AR in Education has potential, how quickly AR can be adopted by the education sector. VR Military Simulations, including helicopter crew refinement simulation (Pilots and winch operator) for the Irish Air Corps: Damien Meade is a current member in the Irish defence forces with 14yrs service, He was a Co-founder of Octagon Games and recently Octagon Simulations, during his time with Octagon Games he was the lead artist. Building City Dashboards: Cordula Hansen and Gareth Young will be demonstrating a digital virtual environment artwork developed for the Building City Dashboards project at Maynooth University. The goal of this initiative is to increase the public impact of the project’s research and to explore and expand creative expression in the digital space by using visualisations of open urban data. Augmented Reality Medical Training App: DataEgg's aim is to automate Augmented Reality in industry while connecting IoT. DataEgg's product platform enables their customers to utilise augmented reality and other visualisation technologies in industry in a reusable and sustainable manner. Immersive VR world with building development and gardens: Stephen Sharkey is a web developer, 3D modeler and VR developer specialising in the Unreal Game Development Engine. Stephen will be presenting a fully immersive VR world, consisting of a building development and gardens. UtilityAR Asset Management Tool for Utility field technicians: UtilityAR is building an Asset Management Tool for Utility field technicians that runs on a selection of Augmented Reality Headsets. It allows a technician in the field to identify an asset that needs maintenance, walks them through the procedure for fixing the problem, and do remote calls back to the office if they need help trouble shooting any problems. Immersive Storytelling in Virtual Reality + Midnight Noir VR: As part of a college thesis titled Immersive Storytelling in Virtual Reality, Sean Thomas, Founder and Creative Director at Hexedron has developed the game prototype Midnight Noir VR, which is an immersive horror experience that makes use of various design techniques that act as guidelines for developing cross-platform games, playable in both VR and conventional 3D setups. HTC Vive Focus heasets with MeetingRoom.io: The HTC Vive Focus is a breakthrough second generation VR headset with 6-Degrees-of-Freedom tracking in a standalone form factor. 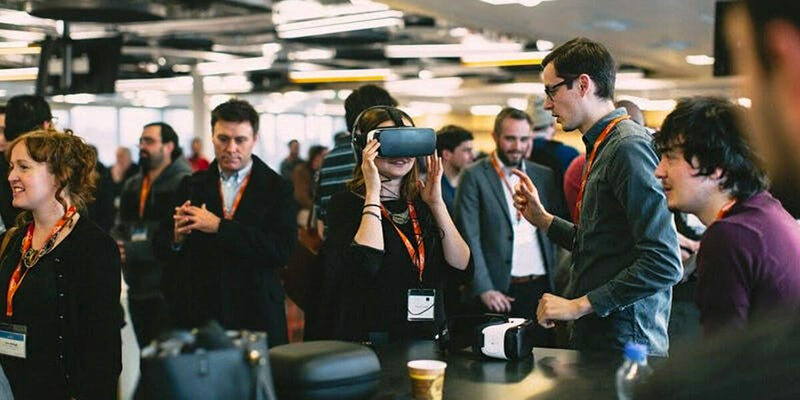 They deliver a new level of freedom to ‘walk around' VR and we're delighted that the team behind MeetingRoom.io will be bringing two of them to this event as well as a demo version of meetingRoom ahead of its open beta release. 3D4Medical – Complete Anatomy and Complete Heart with ARKit on the iPad Pro: 3D4Medical will demo how medical professionals and students can use Augmented Reality to gain better understanding of complex anatomical structures and principles. They will showcase key anatomical systems in AR, highlighting their new and interactive beating heart.